As professional wedding photographer I know that combining a few elements will give me a stunning photograph. Fortunately on this big day at Liberty Grand I was able to juxtapose those elements to create visual masterpieces for the bride and groom. 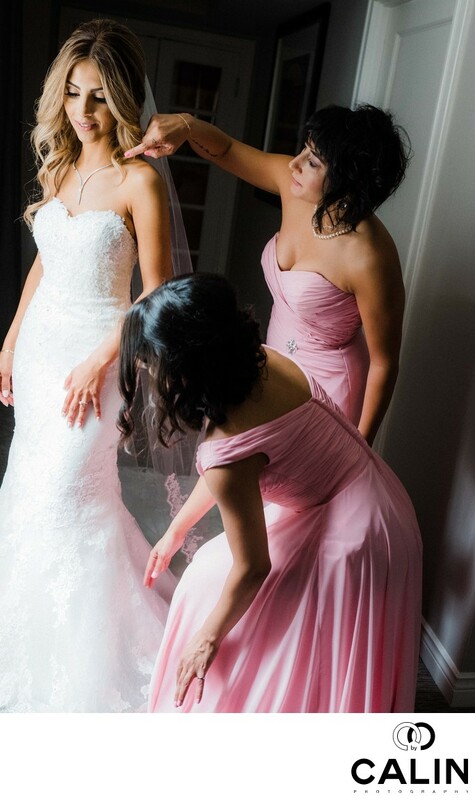 A few minutes before the bride left for her first look, followed by the outdoor wedding ceremony at Liberty Grand, two members of the bridal party helped her with the final details. Please keep in mind that this beautiful bride is a designer who has an exquisite sense of style. As you would expect, everything had to be perfect and it was indeed. As such, right before we headed towards the first look place, the girls took care of the last details to ensure the bridal perfect on her big day. He we can see the maid of honour raising off church she made sure the shoes were properly tied. On her right, another bridesmaid is adjusting one of the brides curls. This photograph has a dynamic look and it feels that the photographer captured a moment frozen in time. One of the tips I learned from an old Toronto Wedding Photographer was to combine motion, emotion and to layer several stories of the special day to create a perfect wedding photo. The tension in this photograph is so intense that we can feel it. The bride features a soft smile and turns towards her bridesmaids. Her best friend is adjusting her curl and look so worried. This was a summer wedding and due to humidity girls had to use a lot of hairspray to make their hair look good. While the maid of honour space is hidden, we can see her hands which looked tense. That adds to the attention of this photograph. To create this beautiful image, I used a few techniques. First, I included, deliberately, three people in this photograph. According to the will of all, all numbers of people make an image look more appealing. Talking with professional photographers in the greater Toronto area I realize that sometimes the don't know elements of composition and design. Given my background is not an arts but rather in business, I had to invest a lot of time studying composition. Speaking of composition, the two bridesmaids create leading lines towards the bride, which makes her stand out as the central element in the photograph. Even more important, the bride is the brightest part in the photograph. A created that by placing the bride close to the window. According to the inverse square law of light, there is a quick fall which creates a natural vignette around the bride. I achieve that by exposing for the bride's face. Before the events of the mirrorless cameras, it was very difficult to nail the exposure and focus simultaneously. Using my Canon 5D Mark III I had to spot meter the brides cheek (which is the brightest part of her figure), lock the exposure, focus and then recompose to frame the photograph properly. All of that in a fraction of a second. Because I switched to Fuji not too long ago, I was able to do that almost instantly.